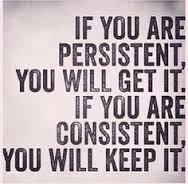 If you were to cook a meal called “success”, persistency and consistency would undisputedly be key ingredients. A street definition of Persistence is “the hard work you do after the hard work you have already done”. In business, persistence is exhibited in the sweat you put in to build your brand and get patronising customers. Persistence is an appertiser; it makes customers think “if this is what we experience when this business relationship is only starting, then the best is yet to come!” Persistence ignites the customer’s expectations! The challenge coming to the business is to replicate that customer experience over and over again or even surpass it so that the customer keeps coming back. This is the art of Consistency. Just as advertising will bring customers to your door but only quality service will keep them coming back; persistency can bring customers to your door but only consistency will keep them coming back. Persistence starts the success journey but consistency sustains it. So what is that goal you are pursuing? It could be a sales target, business project, academic achievement, career promotion, ministry impact etc. Go ahead, be persistent to acquire it and be consistent to retain it. This entry was posted in Customer Service (workplace), Just Thinking and tagged brand, business, consistency, customer service, goal, persistence, persistency, service. Bookmark the permalink.